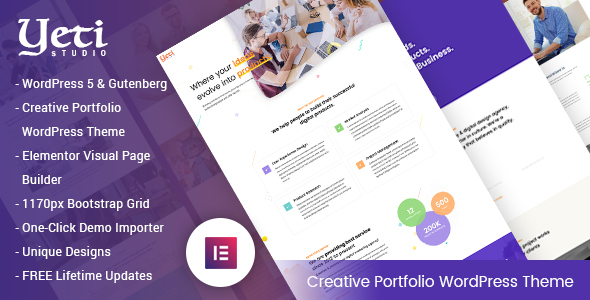 Yeti is a modern, professional and clean creative WordPress theme. Yeti is developed based on frontend visual drag and drop plugin: Elementor. Can create any layout or pages using this plugin easily with just drag and drop. Yeti is suitable for every type of business agency, creative studio and Freelancers. Well planned design of all pages needed for a complete project. Choose one of our template that suits you and create something wonderful for your business. We have included 2 pre-defined layouts for home page to give you best selections in customization.